Writer Jason Aaron (SOUTHERN BASTARDS, THE GODDAMNED, Scalped) and artist Cameron Stewart (MOTOR CRUSH, Fight Club 2) will release a deluxe hardcover edition, brimming with extras, of their acclaimed miniseries THE OTHER SIDE this July from Image Comics. 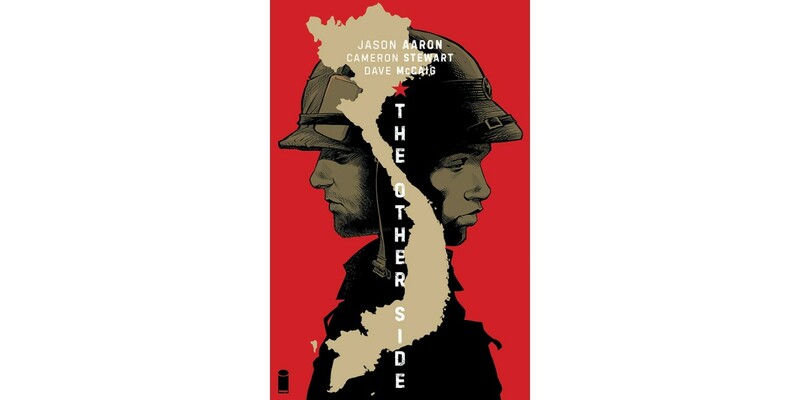 THE OTHER SIDE tells an unforgettable Vietnam War story from the point of view of two young soldiers on either side of the conflict. This deluxe edition will also include loads of extra materials straight from the files of both writer and artist—including Cameron Stewart’s pictures, drawings, and journal entries from his preliminary research trip to Vietnam. THE OTHER SIDE SPECIAL EDITION HC (ISBN: 978-1-5343-0222-8, Diamond code: MAY170642) arrives in comic book stores Wednesday, July 26th and bookstores Tuesday, August 1st. The final order cutoff deadline for comics retailers is Monday, June 26th. THE OTHER SIDE SPECIAL EDITION HC is available for preorder via Amazon, Barnes & Noble, Indiebound, and Indigo.